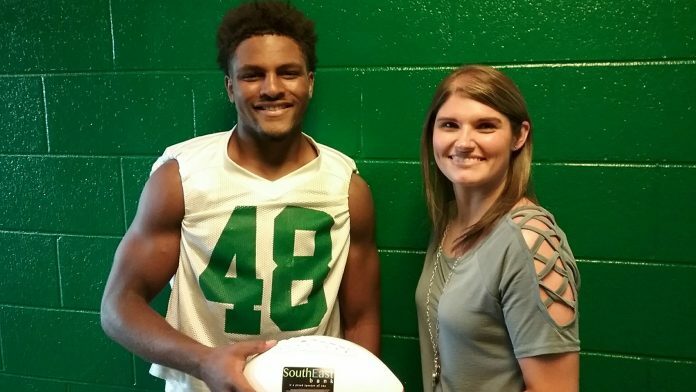 Golden Eagle senior Bo Garmany earned SouthEast Bank’s Player of the Week honors for his performance during Rhea County’s, 49-10, rout over district foe Walker Valley. Garmany’s speed at defensive tackle kept him in the Mustang backfield to recover two fumbles, two solo tackles, and two assisted tackles. Garmany and the Eagle’s will travel to Athens to play longtime rival McMinn County Cherokees (6A) this Friday with hopes of building on their now 2-0 record. The Player of the Week Award is sponsored by SouthEast Bank.